Sideboards may seem like an old-fashioned type of furniture to put into your dining room, but there's a reason they're still so popular . . . they're so practical! With plenty of room to store extra dishware, flatware, napkins and tablecloths--plus that extra space on top for large platters and bowls of food that just won't fit on the table during your holiday feasts . . . well, you'll wonder how you managed to do without one. 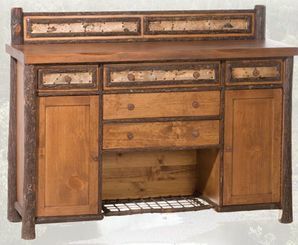 Here we have a nice selection of sideboards from which to choose. Enjoy.